A commemoration ceremony has taken place to mark the start of construction of the US$211 million suicide deterrent system being added to the Golden Gate Bridge in the US city of San Francisco. Following the ceremony, yellow marigolds were planted alongside the bridge by speakers and the families of some of those who have died there. 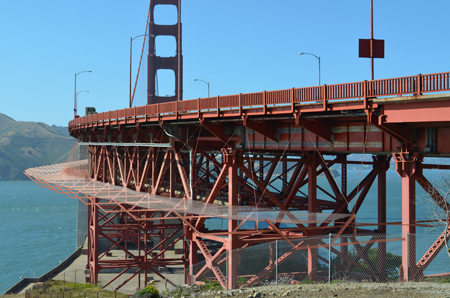 In May, contractors will begin installing temporary fencing along the bridge approaches and around the tower legs. They will create detailed measurements so they can begin manufacturing the stainless steel net. In mid-2018, they will begin installation of the suicide deterrent. Similar systems have been used in various locations around the world, but never in this scale. The deterrent at the Golden Gate Bridge will span 2.7km of roadway on each side. It will be located 6m down from the footpath and extend 6m out, over the water. The suicide barrier will be built over four years, with an expected completion date in 2021. Funding for the project has come from multiple sources – the Metropolitan Transportation Commission, Caltrans, Golden Gate Bridge, Highway & Transportation District, state mental health funds and donations. The total cost is US$211 million, which includes construction (US$204 million), design and environmental expenses.